A brief history of how ATF got into the arson business. ATF's early arson jurisdiction is embedded within explosives legislation dictated by two critical Acts: the Gun Control Act of 1968 and the Explosive Control Act of 1970. The Gun Control Act of 1968 not only dictated firearms laws, but also focused on jurisdiction over destructive devices. Before this Act, arson was considered to be outside ATF's jurisdiction, unless the device used to ignite the fire was a traditionally recognized destructive device or an explosive. The Organized Crime Control Act of 1970 (commonly called the Explosive Control Act of 1970) established penalties for the misuse of explosives and outlined regulations for the manufacture, importation, sale and storage of explosives. The National Laboratory Center and its world-class Fire Research Laboratory (FRL) ? The FRL is the first institution of its kind in the world. It provides the facilities, equipment and staff to work on important issues involving fire scene reconstruction, validation of fire pattern analysis, impact of accelerants on fire growth, and electrical fire cause analysis. The FRL provides invaluable tools for ATF's arson enforcement mission, its training capabilities, and its support to criminal investigations. It is also a critical resource for state and local agencies. ATF laboratory facilities provide expert opinion and court testimony for local agencies involved in arson investigations. ATF determined that the use of a flammable liquid when mixed with an oxidizing agent fell within the definition of "explosive" as set out in the Explosive Control Act. Under this broadened interpretation, ATF successfully prosecuted three men in a U.S. District Court in Savannah, Ga. While this was not the first successful conviction for arson under the Explosives Control Act, it was the first in which a broadened interpretation of the definition of explosives was applied. Thus, a violation of the Explosive Control Act had been established that supported the interpretation of gasoline used with an oxidizing agent to damage or destroy any building, vehicle, or other real or personal property in interstate or foreign commerce, or in any activity affecting interstate or foreign commerce. With this interpretation supported, ATF had the authority to directly investigate many more arson cases than previously. Left: ATF's Predecessor ? 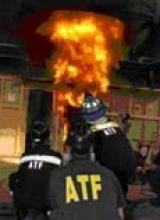 ATF investigated arson cases since before it became an independent bureau in 1972. From 1968 to 1971, the Bureau was the Alcohol, Tobacco and Firearms Division (ATFD) under the Internal Revenue Service, Department of the Treasury. ATFD made its first fire-bombing case (which today would be called an arson case) in early 1969 in Mobile, Ala. This truck is an example of an early response vehicle developed to respond to violations of the new legislation. Right: Church Arson ? Responding to a sharp increase in arson cases involving houses of worship, President Bill Clinton formed the National Church Arson Task Force. This plan implemented a strategy to identify and prosecute arsonists. Between January 1995 and May 1997, ATF investigated 429 church arson crime scenes. ATF formed the first federal arson task force in 1977, in Philadelphia. The agency provided on-the-job training to ATF agents by temporarily assigning them to the Philadelphia Arson Task Force. In addition to ATF, this task force consisted of FBI agents, postal investigators and Philadelphia police and fire investigators. ATF soon expanded the arson task force model to 10 other cities with acute arson problems. By November 1977, with the support of the U.S. Department of Justice (DOJ), ATF expanded the concept to all 23 DOJ strike force cities. By 1978, ATF recognized the need to address the growing epidemic of arsons and established two national response teams. The idea was to develop a well-trained team of specialists who could be convened on short notice anywhere in the United States at the site of a major arson or bombing. New Concept ? On May 25, 1979, ATF's NRT was called for the first time to an arson scene. Ten agents supported by explosives technicians and scientists began arriving at dawn the following day. The NRT proved both its worth and validated the new investigative concept. Certified Fire Investigators (CFIs) are special agents who have undergone an extensive two-year training program in the field of advanced fire scene examination, with emphasis on principles of fire dynamics. CFIs provide expertise in fire origin and cause, and are among the most technically competent fire investigators in the world. Because the investigation of explosions and fires can tie-up many agents for long periods, these quick response teams would offer relief to local ATF agents allowing them to conduct their regular investigative work uninterrupted, and leaving the investigation of the major arson cases to the response team. Each team consisted of 10 special agents, augmented by technicians, forensic scientists and auditors. On May 25, 1979, a major fire in Shelby, N.C., destroyed a downtown block of buildings, killing five people, injuring 31 people and causing more than $5 million in damage. ATF's National Response Team responded for the first time. Working with state and local officers, two men were arrested on felony murder charges. ATF had validated its National Response Team concept. On the Scene ? Larger fires often require ATF's National or International Response Teams to assist with scene processing and evidence collection, identify the fire's origin and cause, and determine if criminal acts were committed. By 1980, ATF identified "arson for profit" as one of the fastest growing crimes in the nation, increasing every year by an estimated 25 percent. ATF began training State, local and other Federal agencies in the detection and investigation of "arson for profit" schemes and related tactics employed by organized crime and white-collar criminals. The agency's close working relationships with these partners resulted in increased federal prosecution. ATF also initiated its own "origin and cause" training programs. Congress continued to provide ATF with additional tools for arson prosecution. In 1982, the Anti-Arson Act amended the explosives laws, specifically criminalizing the use of fire to commit any federal felony. The Act made it unlawful to damage or destroy, by fire, any property used in activities affecting interstate commerce. "The Bible" ? 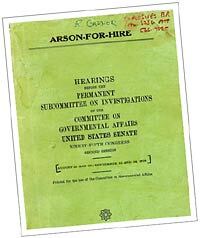 The original Arson-for-Hire book used by ATF investigators throughout the late 1970s and early 1980s until the Anti-Arson Act of 1982 was passed. This book became the "bible" as to the congressional intent of the Explosive Control Act of 1970. The Church Arson Prevention Act of 1996 granted federal prosecutors greater power in pursuing burnings and desecrations at houses of worship. 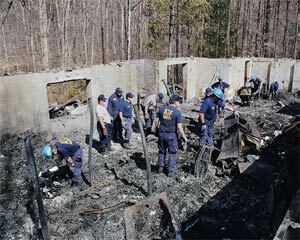 ATF has a staff of forensic auditors trained to assist arson case agents from ashes to trial. The forensic auditors follow the complex paper and money trail to link the arson suspect to the fire. ATF forensic auditors assist on search warrants; interviewing witnesses and owners; analyzing financial documents; and preparing demonstrative evidence used for indictment and for courtroom testimony. The Homeland Security Act of 2002 established the Department of Homeland Security and outlined responsibilities for fighting terrorism. 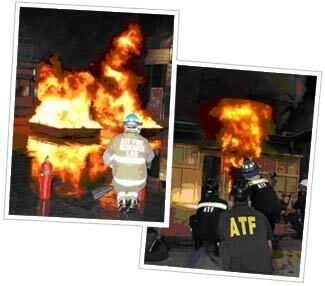 As a result, ATF was transferred to DOJ and given a more effective legislative tool, the Safe Explosives Act of 2003. This Act restricted the availability of explosives to prohibited persons. It also strengthened licensing and permitting requirements.